Each of the next number of months we will tell you a little bit about two members of our family and their role on the farm, their interests, and the talents that they contribute. This month we will introduce the two people that you will likely meet when you come to the farm to pick up chickens or if you call on the phone. Cathy grew up near Hutchinson, Kansas. Her father was a dwarf and passed away from skin cancer when she was 20. She also had a severely mentally handicapped brother and sister who have also passed away. The challenges of helping care for her handicapped brother, developed character and strength in her. We met in Bible college while we were singing on the college chorale on a 12,000 mile tour through the US and Canada. 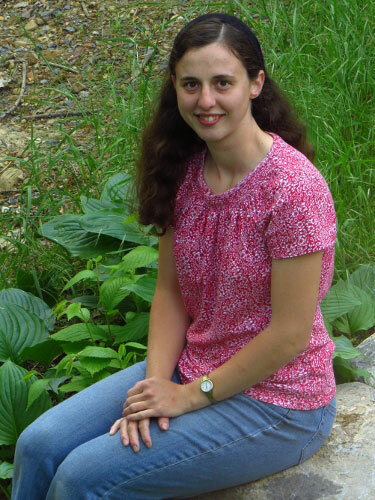 Cathy is a talented musician and can sing soprano, alto, and tenor. Her favorite instrument is the piano/keyboard, but she can also play the guitar, accordion, and autoharp. 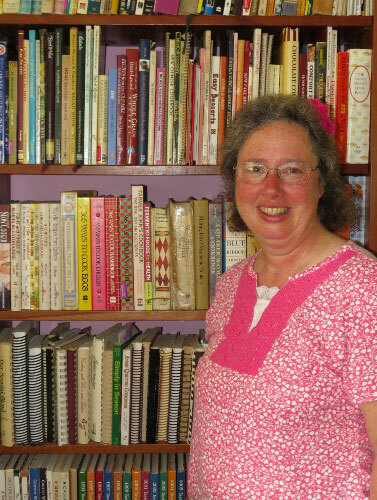 Cathy with her beloved cookbooks. It is said that an army marches on its stomach (its food). In the same way on our farm, we do our farm work on our stomachs. Good nutrition is important to Cathy and she keeps us well fed with a wide variety of foods and ways of preparing them. She likes to garden, not for gardening’s sake, but to produce the most nutritious food for her family that she can. Cathy cooks almost exclusively from scratch using whole foods from our garden and farm, with only a small part being purchased. Bread, cookies, and other baked goods are made from whole wheat that she freshly grinds into flour just before making the item. Cathy and the girls can or freeze over 1,000 quarts of fruits and vegetables each summer. If you have a question about how to prepare chicken, turkey or lamb, she is the one to ask. She loves to talk about cooking and also loves to hear about good ways of preparing and seasoning food that you have found. She loves it when people stop by between chicken processing dates to purchase products and chat. Cathy also has a strong interest in heath and how to help people to be healthy. Kara is our oldest daughter and is 20 years old. She works full time on the farm as cook and gardener. She also helps with chicken processing, and processing eggs. Kara enjoys gardening and is in charge of our greenhouse where she raises plants for our gardens and flower beds. Kara, like her mom, is a good cook. The guys say that they can’t tell a difference between her cooking and her mom’s. So if you have cooking questions, she can probably answer them too. She enjoys singing and can sing soprano and alto. Kara also plays the flute. Kara also has an interest in health and herbal healing. This past winter she completed a herbal healing course from Dr. John Christopher’s School of Natural Healing and is certified as a Family Herbalist. Kara is the one who makes the Everyday Miracles Salve that has been so helpful to us. What you are about to read is a different perspective than what you normally hear about our use of fossil fuels. We have within our reach the ability to solve many of the environmental problems that we face today with the use of “non-renewable” energy sources — crude oil, natural gas, and coal. We get the impression from many scientists that our use of fossil fuels that we are removing from the earth is polluting our environment with unnatural toxins that should not be there and that we are creating a big environmental problem with greenhouse gases. But their field of view is too narrow and pessimistic. We have the opportunity of recycling fossil fuel energy back to it original form. In the process, not only can we solve many of these environmental problems, but we can significantly increase food production to feed a growing world population using organic methods. Chemical farming and GMO’s are not the answer for increasing food production to feed the world. To see the solution, it is necessary to see the bigger picture of what fossil fuel energy really is and how it can be recycled. Fossil fuels are formed from the remains of dead plants and animals that were buried many years ago. In Pennsylvania, layers of coal can range from a few inches to 10 or 12 feet thick. To make coal or oil, plant and animal matter is highly compressed. Now try to imagine how many plants it would take to make a layer of coal that was only one foot thick. What those layers of coal and oil tell us is that many years ago the soil was highly productive and produced vast amounts of vegetation that in some locations was likely much greater than anything we have seen in modern times. In physics, The Law of Conservation of Energy states that energy cannot be created or destroyed, but it can change form. Energy is said to be conserved over time. In the case of fossil fuels, when they are burned the energy is not destroyed but rather changes form. A significant portion becomes carbon dioxide. But before we go further, we need to back up and look at where fossil fuels came from in the first place and look at the carbon cycle. First, in very ancient times there was very fertile topsoil that was rich in carbon. That very fertile soil produced vast amounts of plant matter. The plant matter was buried and over many years was converted into fossil fuels. Today, fossil fuels are being removed from the earth and burned and vast amounts of carbon dioxide are being put into the air. What we need to do is to capture that ancient topsoil that is now floating in the air as carbon dioxide and put it back into our topsoil. If we can accomplish that we have the potential to significantly increase food production. The bottom line is: gasoline came from topsoil, we burned it in our car and put the “topsoil” in the air. It is interesting that many of the oil rich countries, such as Iraq and Saudi Arabia, are largely desert countries. Their topsoil is buried way below the surface in the form of oil. (It is interesting to note that the Garden of Eden, with its lush vegetation, would have been in their general area.) They are pumping their topsoil out of the ground as oil and selling their topsoil to us to burn in our cars. We are burning their topsoil and using the energy for transportation. In the process we have put their topsoil into the air where it is polluting the environment. Our responsibility and opportunity now is to recycle the topsoil out of the air and put it back in the topsoil where it belongs. Why is it important that we recycle carbon out of the atmosphere and put it in the soil? We have a great opportunity to restore soil productivity back to the way it was right before fossil fuels were formed. The carbon dioxide in the air is an important resource that we need to utilize. Adding carbon to the soil helps make the soil more drought proof. Carbon is like a sponge and can hold about four times its weight in water. Therefore increasing the carbon content of the soil enables the soil to hold water for an extended time after it rains and makes more water available to the plants. High carbon soil can also absorb moisture from the air during times of high humidity, increasing the water available to the plants even though it doesn’t rain. Carbon in the topsoil makes it more porous so that when it rains the water soaks into the soil and does not run off as quickly. That is important for keeping the water where the plants can use it, but it also is very important in reducing topsoil erosion and flooding. This summer here on the farm we had an inch of rain in less than a half hour. I went to a place where we have often had water running off the pasture in the past. This time there was no run off. The soil had absorbed the entire inch of rain. That was a satisfying result of the work we have done in increasing the soil carbon content of our soils. Carbon also provides a “hotel” for the microbes and bacteria in the soil. Those microbes and bacteria in the soil are important for making nutrients and minerals available to the plants and converting decayed plant matter into soil carbon. It is important that we complete the carbon cycle and put the “topsoil” that we burn in our cars back into the soil where it belongs. The real answer to feeding a growing world is in organic farming that sequesters carbon and builds topsoil. Recently our family watched “Frontier House”, a PBS historical reality series that first aired in 2002. Three modern families were selected to go back in time to 1883 on the America Frontier in Montana during the Homestead Act. Each family needed to establish their homestead as if they were living in 1883, and prepare food and firewood for the coming Montana winter. Would they be able to survive the winter? One of the things that stood out to our family was how little food that they actually had for the winter. The growing and preservation of food for the winter seemed to be way too low on their priority list. They had small gardens and did not have much set aside to make it through the winter and the spring until the next summer’s harvest came in. Most modern families, by going to the grocery store two or three times a week, buying lunch at school or at work, and eating out several times a week, do not realize how much food that they actually eat in a year’s time. I went to the mom of our largest chicken customer and asked her how much food her family needs in a year’s time. It is a family of eight that produces a lot of its own food and tries to source as much local food as possible. It is hard to believe that one family would eat that much food, but I know it is true because it is our family. We made a decision a number of years ago, that if we wanted our family to be healthy, we needed to opt out of the grocery store/ restaurant food system (including the organic grocery stores) as much as possible and produce our own food. Our observation has been that most of the people who eat that food are not as healthy as they should be. That is evidenced with around 70 percent of the US population being on at least one pharmaceutical drug. Our family’s goal is not to be food independent, self-sustaining, or homesteaders, but to be healthy. Health is often taken for granted until one is sick or lacks energy. Life is too short to live it in an unhealthy state and not be able to enjoy life as one should. It is much easier to eat right to stay healthy, than to try to get healthy once we get sick. The nutrient value of all the foods that we eat is more important than what most people realize. We try to grow as high brix and as nutrient dense food as we can. We are what we eat. It is difficult to be healthy if the food is low in necessary nutrients and when the chemicals and antibiotics in the foods are working against us. In one of the upcoming newsletters we will be sharing with you about a harmful antibiotic that is in much of conventionally produced, non-organic (and non-GMO) foods. We found out about this harmful antibiotic a little over a month ago. In the June 2009 farm newsletter we shared how we were making charcoal and experimenting with it to make Terra Preta soil in our garden. We applied about an inch and a half of charcoal and incorporated it in the top six inches of soil in a three foot wide strip across the rows of vegetables in half of our garden. Unfortunately, we did not see any improvement in growth, drought resistance, or brix improvement to the plants grown in the charcoal enriched soil in any of the years since then. I suspect that there is some other ingredient in Terra Preta soils that make them so productive. To Plow or Not to Plow, That is the Question! Note: Whether you garden or farm or not, I believe that you will find this article interesting. The subject “To plow or not to plow” is a much more important subject than what most of us realize. There is a surprising conclusion. In farming and in gardening there are opposing voices, those saying that the ground should not be plowed or tilled and others saying that the soil should be plowed. Both methods appear to work, but which one is the best? One of the challenges in life is discerning the best solution to take. There are many things in life that “work” and highly educated people promote them as being the answer, but in the end there are consequences or side effects that outweigh the good. It is also important to ask the question: “It is better as compared to what”. For our family, we are not just interested in producing food to eat, we also want to produce the most nutrient dense food that we can. No-till farming has been growing in practice here in the U.S. The method used by most farmers today is to spray Roundup to kill the cover crop or weeds that have grown in the stubble of the previous crop. The new crop seeds are planted with a special no-till planter through the dead plant mat that is left on the ground. No-till farming has enabled farmers to be able to farm a considerably larger number of acres because all they have to do is spray and plant. No plowing and no cultivating. For me, the subject to plow or not to plow came up again this past winter when we watched the video “Back to Eden.” It was a documentary of a man who had an impressive looking garden. The documentary had excellent pictures of beautiful plants. Most of the shots were close up and it looked impressive. He did not plow or till, but used a mulch layer on the ground to suppress the weeds and build a rich black soil. He had been gardening this way for a number of years and was getting good results. The method of gardening was presented as God’s method, and as an almost no work garden. I was convinced enough to try it on some of our vegetables. A lot of Bible verses were quoted throughout the video. But is he right? I found a website, called “Farming God’s Way”. It is an organization that is teaching African farmers how to farm and to provide for their families. They too advocate not plowing and putting down a layer of mulch. They call the mulch layer “God’s blanket”. They intersperse the teaching on the farming method with Bible verses. It sounds like a very Biblical method. But are they right? The voices cautioning that the ground should not be plowed or tilled have been around for a long time. Newman Turner and Ruth Stout from years ago both strongly recommended that the ground should not be plowed. About six years ago, our family went to visit the Rodale Institute’s organic research farm in Pennsylvania for their farm open house. I was very interested in their no-till system that appeared to be a real answer. They had developed an organic no-till system that did not use chemicals. They invented a large roller that would roll the cover crop and kill it by crimping the plants. The roller was mounted on the front of the tractor and a no-till corn planter was pulled behind the tractor for a one pass planting. The cover crop created a mat, or mulch layer that helped conserve moisture and provided nitrogen for the crop. I was impressed with the system and we went back the next year to learn more. That year I was not as impressed. There were a number of problems that they had not been able to fix and the yields were not as good as conventional tilling. On the other side of the subject is the teaching of Carey Reams. Reams stressed the importance of plowing to reverse the calcium and phosphates in the soil. Calcium tends to move down in the soil which is evidenced by stalactites and stalagmites in caverns. Phosphates tend to rise to the top where they can be washed into streams and rivers. By turning the soil over, the calcium is kept in the topsoil layer and the phosphates are buried back in the soil. Calcium is an important element in producing nutrient dense, high brix food. So which method is best, to plow or not to plow? For me as a farmer in researching a farming method, I like to go to the oldest agricultural book, the Bible, and see what it says. On this subject it opened a window into a totally new perspective for me, that enabled me to see the collision course that farming is on today. The Hebrew word translated “dress” means to till. Even in the garden of Eden it was necessary to cultivate. Tilling, or plowing appears to be an important part of creating a fertile and very productive field or garden. Plowing produces clods of earth. Cultivation breaks up the clods. This passage says that God’s method is to plow the soil – the opposite of what the Back to Eden film said, and the Farming God’s Way states. In my research, on almost every subject, I have found Christians saying and believing opposite things to be true. It can be confusing and misleading if you take what one person says without checking things out yourself. The oldest agricultural book has some strong words about no-till farming and this is what opens the window to a bigger perspective of the subject. Proverbs 12:11 He that tills his land shall be satisfied with bread: but he that follows vain person is void of understanding. Proverbs 28:19 He that tills his land shall have plenty of bread: but he that follows after vain persons shall have poverty enough. Plowing and cultivation are important for success in farming and in gardening to produce an abundant crop. “No-till” is following “vain” persons who think that they know and have the answers, but in the end it results in poverty. So, is the old agricultural book right? Is no-till following vain persons? Does no-till result in poverty? There are some interesting things that have come out recently. In conventional farming, no-till comes in a package. It requires the use of lots of chemicals – Roundup to kill the grasses and weeds, GMO (Genetically Modified Organisms) seeds to resist the Roundup, pesticides and fungicides to kill the bugs and fungus because the crops are so low brix that the bugs and fungus try to eat it up to return it to the soil. No-till is a method that is promoted by the Monsanto Corporation who gives huge donations to many of the big university agricultural departments. So, of course, the no-till trials show the no-till advantage. But one thing to remember is to ask the question: “No-till is better as compared to what?”. They are not comparing no-till to properly remineralized, plowed, and cultivated soil, and they are not looking at the long term effects of the whole no-till system. They are looking primarily at short term crop yield comparisions. The no-till revolution has resulted in a very high percentage of conventional soybeans and corn being genetically modified to resist Roundup. A New York Times article talking about GMO Roundup Ready crops says: “Those crops made it so easy for farmers to control weeds by spraying glyphosate [Roundup] that Roundup Ready crops now account for about 90 percent of soybeans and around 70 percent of the corn and cotton grown in the United States. And use of glyphosate skyrocketed, at the expense of rival herbicides.” They go on to say how super weeds are becoming resistant to Roundup, and Dow Corning is looking for approval for their GMO corn that is resistant to 2,4, D (an ingredient in Agent Orange) so that 2,4,D can be sprayed after the corn comes up, instead of Roundup to control the Roundup resistant super weeds. The United Nations in a report states that the suicide rate for farmers worldwide is higher than for non-farmers. In the Midwest of the U.S. where most of the corn, wheat, and soybeans are grown, suicide rates among male farmers are two times higher than the general population! This is a sad and telling statistic. No-till farming has not resulted in grain farmers becoming more successful. They have become more dependent on the big corporations and the chemicals and seeds that they sell. The more dependent that they have become, the more it drains their wallet. Finally, in despair and financial hopelessness they commit suicide. As I reflect on the above information, I realize that what that old agricultural book said: “He that tills his land shall have plenty of bread: but he that follows after vain persons shall have poverty enough.” is more accurate and not as radical as what it first sounds. The long term results of no-till is not sustainable because of its heavy dependance on chemicals and GMO seeds and the poverty that they bring with them, not only to the farmer, but also to those who eat the GMO grains. Healthcare costs have skyrocketed in recent years and are draining the wallets of the consumer, bringing them poverty and dependance on the government to supply healthcare. It is helpful to be able to step back and see the bigger picture. In the end, the big corporations such as Monsanto and Dow Corning will fail because their products are not sustainable and end in poverty. It all goes back to a subject that at first appears to be relatively unimportant – To Plow or Not to Plow — That is the Question! With each passing year, it is becoming more important that you have your own garden if you want to be healthy. Acid rain and sulfur and other acid fertilizers are removing the water soluble calcium in the soil. The rain water that I have been testing this year has been running about 6.0 pH. The USDA reports a significant decrease in calcium in our foods over the last 50 years. The calcium in our food is much more available to our bodies than calcium supplements. Sometime I would like to go into detail about my research about calcium, but for now I will just share this — calcium is required for each cell in our body to be replaced. If calcium is not available, the cell cannot be replaced and degeneration occurs. Calcium is much more important than just for our bones and teeth. It is important to put high calcium limestone on your garden each year to replace the calcium lost to acid rain and what is removed in the produce you harvested. Another important reason for having your own garden is to be able to provide food for yourself and your family if our food supply in the grocery stores becomes disrupted. Food is a necessity of life, and we as a nation have become dependent on other countries and states on the other side of the US to supply a significant amount of our food. Knowing how to raise your own food is an important back-up plan. We need to share with each other things that work and things that don’t work in gardening. Gardening is an ever learning process. I have observed that it is easy for gardeners to get focused on the wrong things in gardening. Weeds are one of those things. 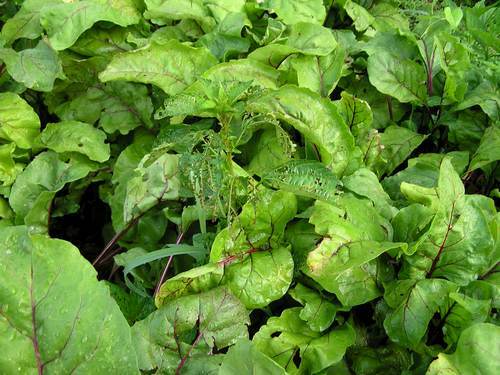 I have observed people going to great lengths and expense to control weeds, as if gardening is all about controlling weeds, rather than producing an abundant crop of nutrient dense food. Controlling weeds becomes a big burden for them and takes the fun away from gardening. Weeds and grasses can be an important fertilizer, they can be a curse, or they can be a lesser part of the gardening experience. This past winter, someone sent us the link to the “Back to Eden” video. It is the story of a man who implemented a method of gardening very similar to the Ruth Stout method of using mulch to control weeds, except he used a lot of Bible verses to make it sound like it was God’s method of gardening. It was an impressive video with great pictures of beautiful plants. He portrayed his method as an almost no work method of gardening. We decided to try the method on two rows in each of our gardens. It was not “no work” gardening!! It was a lot of work loading the wood chips into wheel barrows and wheeling it into the garden and spreading it. I was glad we did not have to cover both of our gardens with wood chips. Recently I looked at the “Back to Eden” garden again and realized that it was only about 1/3 the size of our smaller garden and 1/6 the size of our large garden. I was surprised at how few plants he really had in the garden. There was a lot of space between the plants. What is easy to do on a very small scale in a hobby garden for fresh eating can become very labor intensive if you are trying to grow most of your food. If we are going to produce enough health giving food to sustain ourselves and our family, there has to be a better way. Carey Reams, who discovered how to grow high quality, nutrient dense food, said that one of the best ways to control weeds is to plant rows close together so that the plants shade out the weeds. We have tried that method for the last several years and it has worked very well for us. It has allowed us to spend little time on weeding. We now spend much more time harvesting than weeding. We garden intensively in rows. The first thing is to get the right nutrients in the soil. We spread about an inch and a half of composted chicken manure on the garden in the fall and plowed it under. Each year we put down some soft rock phosphate and high calcium limestone. The first year, put down about 50 lbs of soft rock phosphate per 1000 square feet and 100 lbs of high calcium limestone per 100 square feet. Each year after that a smaller quantity of each should be put down to replace what was removed and depleted during the year. In the spring, we rototill the garden and plant the rows of green beans, corn, and other row veggies in rows 24 inches apart. The potatoes we plant 30 inches apart. This spring we made the mistake of planting some of the sweet corn 30 inches apart. That allowed significantly more grasses and weeds to grow. The rest of the story we will tell in pictures. After the plants emerge, we use this small tiller to cultivate out the small weeds. 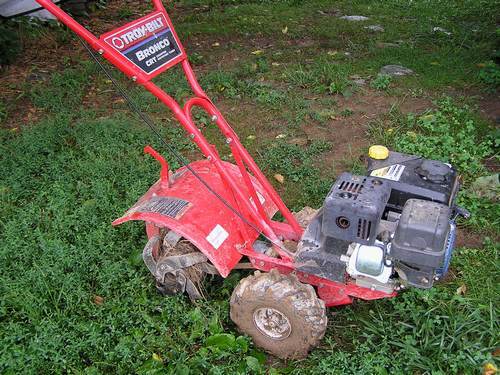 It has only a 14 inch tilling width and easily goes down the rows planted 24 inches apart. It only takes about an hour and a half to till a 1/4 acre garden. We then hoe out the weeds in the row. In the sweet corn and potatoes we cover the small weeds as we hill the corn or potatoes. It is much faster than hoeing out the weeds. About a week or so later, we run the tiller between the rows again. This is the last time it needs to be tilled. By then the plants are starting to shade out the space between the rows and the weeds don’t have a chance. This is 10 rows of green beans 50 feet long. There are another two rows of green beans that are to the right of the picture. Notice how the rows have grown together, shading out the weeds and shading the ground from the sun and reducing the drying out of the soil. When a wider row spacing is used, it allows sunlight to reach the soil and germinate lots of weed seeds. The ground has the desire to always be covered. Does planting the rows close together reduce the yield? Not if there are enough nutrients in the soil. The first picking of green beans was four buckets. 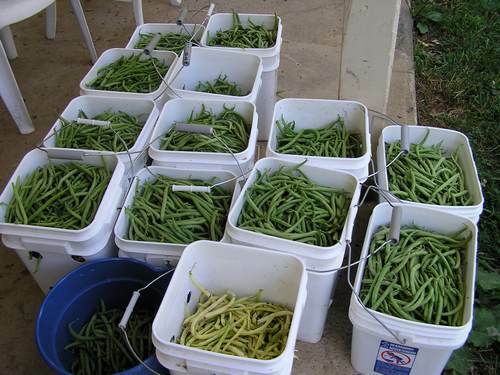 The second picking was last Monday with about 13 buckets of green beans. 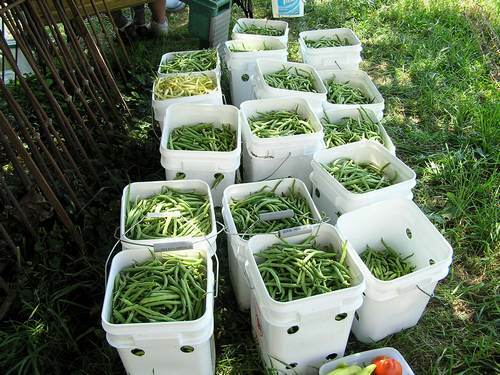 The third picking on Friday produced another 15 1/2 buckets of green beans. The beans had very few bug holes and when cooked were tender and delicious; nothing like what you buy in the store. 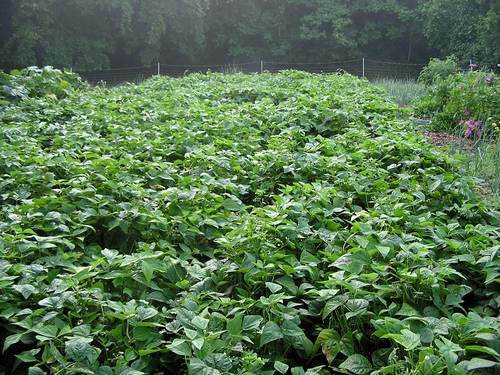 The yield so far is the equivalent of 5.6 tons per acre and there are still more beans growing on the plants. Cathy and the girls canned about 200 quarts of beans and froze another 100 quarts. We all helped pick and snap the beans. It took much longer to pick the beans than what we had spent total in weeding. The outdoor canner was great because the ladies could can 26 quarts at a time and it kept the heat out of the house. The zucchini was planted in a row and the squash and pumpkins to the left were planted 5 feet apart in each direction. 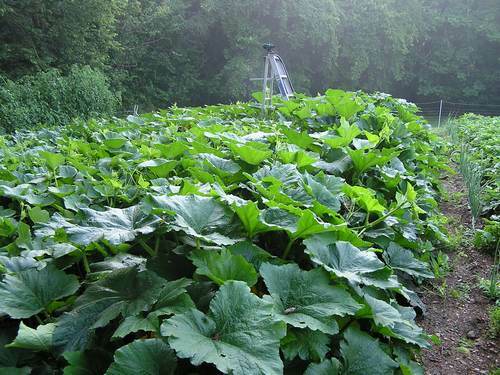 That is a 6′ step ladder with a sprinkler on top which shows how tall the squash plants are. I am realizing that watering the garden before it gets really dry is an important part of controlling weeds because it allows the vegetable plants to continue growing rapidly and stay ahead of the weeds. This year we also discovered another foliar spray that dramatically raised the brix of our pasture grasses and some plants in the garden. It is important to test how a foliar spray is working by testing the sap of a plant leaf with a refractometer. The same spray can cause the brix to drop in some plants and raise it in another. The formula is 4 of our raw pasture raised eggs and a tablespoon of feed grade molasses in a gallon of water. It puts a glossy shine on the leaves. Weeds and grasses are an excellent fertilizer, as the trees in our American chestnut orchard illustrate. These trees were planted as nuts only five years ago. The gate is about 9 1/2 feet high to the cross bar. The trees have grown so dense that it is difficult to walk through the orchard. We repeatedly hear that it is important to keep the weeds down so that they don’t compete with the plants that we want. 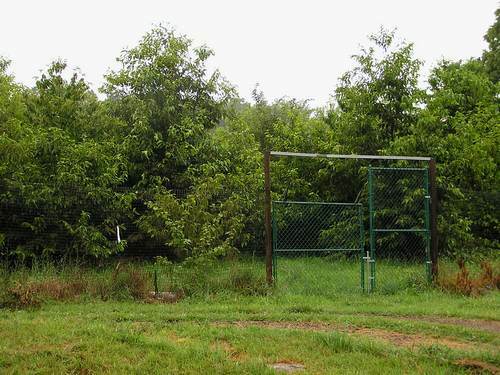 You often see orchards where they have sprayed RoundUp under the trees to control the grass and weeds. We did the opposite in this orchard. When the trees were smaller, we allowed the grass and weeds to grow 1 1/2 to 2 feet tall before we mowed it. It was not unusual for some of the grass to be above the hood of the lawn tractor. What we were doing was building topsoil with the grass. The roots of the grass go down about the same distance as what the plant is tall. When it is mowed off, the roots of the plant die off until they are about the same size as the plant that is above the ground. Those decaying roots made topsoil to the depth of two feet. By repeatedly allowing the weeds and grass to grow tall and mowing them off year after year, it created a soil that allowed the chestnut trees to grow rapidly. The same principle can be applied in the garden. After a crop is harvested for the year, rather than tilling up the ground and letting the ground be bare, allow the weeds and grass to grow, but mow them off before they produce seeds. Use the weeds to your advantage.